With this post on Scare Tactics #8 we wrap up the the Convergence crossover featuring Amethyst in the Weirdoverse books. I feel like I involuntarily signed myself up for a Siberian death march and I only have a few more miles to go before I can collapse. Scare Tactics is a rock band of monsters. Check out Andrew’s profile of them in his Nobody’s Favorites series if you want to know more. I am really thankful that I was utterly unaware of these comics during the 90s, as I had taken a vacation from the super hero comics world and was soon about to start sampling early manga releases like Mai the Psychic Girl and Grey (anyone remember that series? 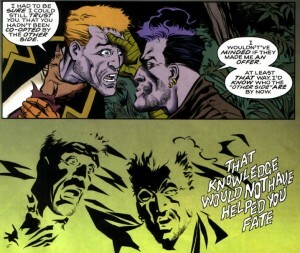 I really need to dig out my old issues and reread it). 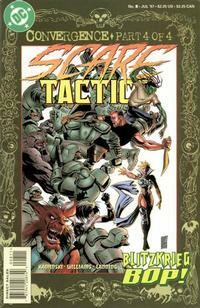 The issue opens with Fate encountering Scare Tactics. 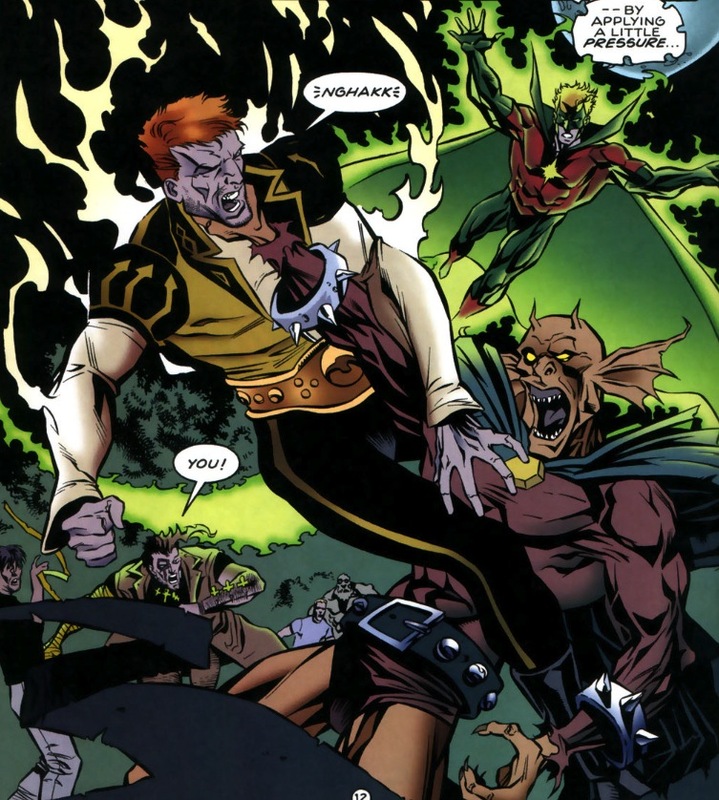 Fate is surprised that they are hanging out with the Demon, a mystical character in the DC Universe who often speaks in rhyme. The gathering is suffused with green light because the Sentinel drops by too. Scare Tactics has a mixed reaction to the idea that Fate thinks of them as the reserves. Fortunately he is going to indulge in a few pages of exposition. He talks about Prince Topaz’s sudden appearance and warning. The Sentinel discusses the end of life on an alien world. The Demon discusses the mystical conclave and the influence of the zodiac. Scare Tactics debates and the hot vampire chick decides to leave because she doesn’t want to defend a world that hates and fears her. Somehow I think that she’ll return several pages later just in time to help out. The remainder of the monster rock band decides to help out Fate. The Demon notices a strange twinkle among the fireflies. It is Prince Topaz in gem form. The Demon squishes him and he manifests in human form. Topaz says that he was spying on them because he wanted to make sure that they hadn’t allied themselves with the other side. Suddenly the Sentinel turns evil and explodes into a horde of Emerald soldiers. They attack our heroes. Not far away Vampire chick realizes that she forgot her lipstick and heads back to her group in time to let loose with a scream that shatters the Emerald soldiers. During the aftermath of the battle Fate realizes that Topaz has run away. Topaz tries to hitchhike. A silver sports car pulls up beside him. When Topaz goes to get in the car, he realizes that Amethyst is the driver. This is not good. You know, I make fun of Prince Topaz a lot. He’s very blond, in love with his own voice, and has the inexplicable habit of constantly seeking high places in order to look down at the scenery while the wind blows through his hair. But he didn’t deserve to go out by that – run over by an evil version of Amethyst while she’s singing a Rolling Stones song. I’m not usually the type to take refuge in the the nerdy habit of deeming events in comics canon or non-canon, but the stuff in this series with Amethyst goes so far against the original spirit of the character that I’m just going to stick my fingers in my ear, sing “lalala” and pretend that this never happened. 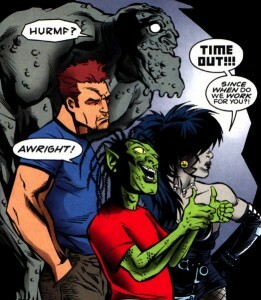 Oh, and Scare Tactics #8 concludes with everybody concerned about the little green bass player dying. I don’t think that anyone would really miss a bass player all that much. This Convergence crossover was without a doubt one of the most incoherent comics crossovers that I’ve ever read. Sadly, the adventures of Amethyst in the 90s continues because she shows up a couple more times in Book of Fate in order to wiggle at Jared while wearing a purple bikini. So I’ll post about those issues once I have the stomach for it. This entry was posted in comics and tagged Amethyst Princess of Gemworld on 11/18/2009 by Anna.